M and M Gold Exchange is proud to offer text service to all of our customers. 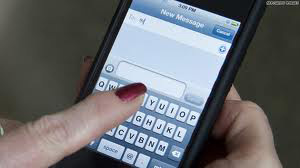 When you fill out our website online form to send us your gold, silver, platinum, or palladium we know send personal texts confirming we received your package and we also text the results and payment details. This will allow a faster payment to get you your cash right away. M & M Gold Exchange is proud to announce that we have launched a new and improved website. Our new website is now easier to use and has more useful information. 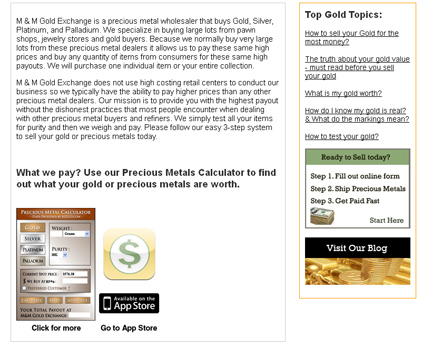 We now have specific gold and silver coin pages with the live pricing that we pay for your coins. We have also launched our free app called Gold Calc which is found in the finance section of the itunes apple store. This app is designed to work on your apple devices including your ipad, ipod, and iphone. 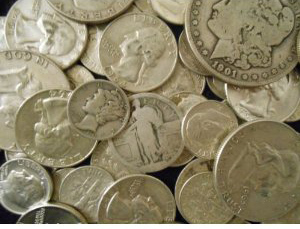 Did you know that pre-1964 U.S. coins are commonly called junk silver. These 1964 and older dimes, quarters, half dollars, and dollars are made of 90% silver. Most people have these coins laying around there house or in there coin collections and piggy banks. With the recent rise in silver prices these coins are now worth near 20 times the face value. One dime is worth over $2.00 and one quarter is worth over $5.00 each. M & M Gold Exchange will pay you top dollar for these coins. Check your coins on a regular basis and contact us to sell your coins right away. Please let us know if you have any questions or concerns. We appreciate and value your business. We buy all gold, silver, platinum, palladium and diamonds. Almost all gold buyers including pawn shops, jewelry stores, and gold buying stores all advertise that they pay more than anybody else and they guarantee to pay the most cash for your gold. This is a clever way to fool the public into thinking whatever they offer will be the most that you will get for your gold or other precious metals. In reality if you read the fine print about the guarantee they all have ridiculous reasons to not honor there advertised guarantee. We recommend shopping around and getting many quotes for your items and after you check with all the local options you will find out that M and M Gold Exchange is the highest paying gold and precious metal buyer in the United States. Check out our Gold Calculator and get a quote today.. Many years ago I was in a meeting with my business partner and we began discussing business opportunities and we were trying to find ways to invest into new business ventures. We began discussing gold and other precious metals. We had heard over and over again that the public was constantly being ripped off by pawn shops, jewelry stores, and other gold buyers. Since the majority of the public is not educated as to how to put the proper value on their gold and precious metals they were being taken advantage of buy these unsuspected companies. We decided the public deserved a better option. We then vowed to educate the public and to offer prices near full market value. M and M Gold Exchange was formed as a company within weeks of this meeting.